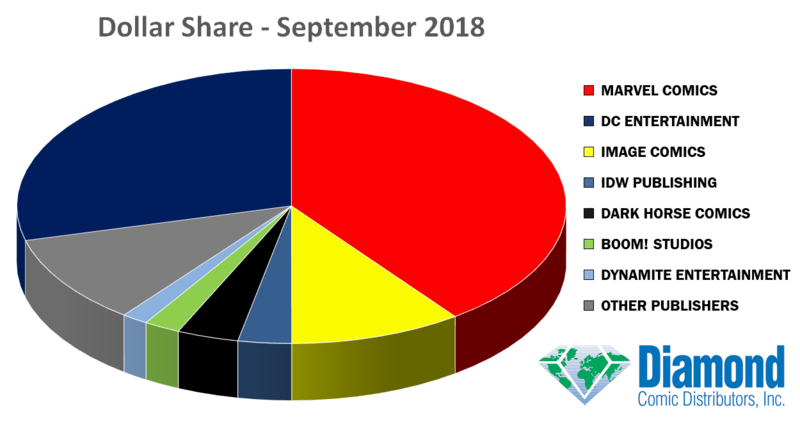 Diamond released their comic book sales info and charts for the month of September 2018 where Marvel comes out on top, but they split the top ten with DC Comics. (BALTIMORE, MD) — (October 12, 2018) — The mystery of Wolverine’s resurrection that has swirled since Marvel Legacy #1 reached its climax in Charles Soule and Steve McNiven’s Return of Wolverine #1 from Marvel Comics, the best-selling comic book of September 2018 according to information provided by Diamond Comic Distributors, the world's largest distributor of comics, graphic novels, and pop culture merchandise. 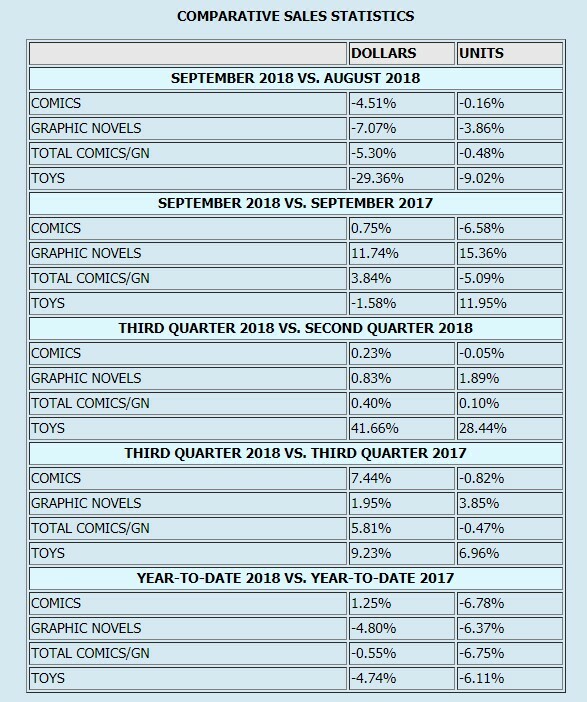 Marvel Comics was September's top publisher with a 39.86% dollar share and a 43.24% unit share. 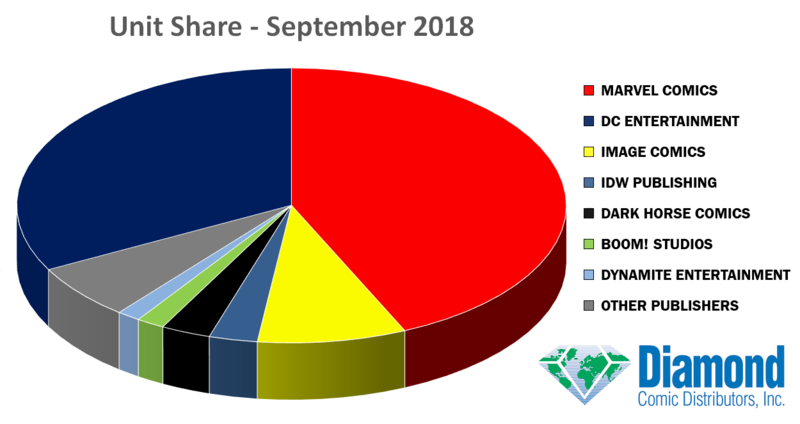 DC Entertainment was second for the month with a 29.06% dollar share and a 32.76% unit share. 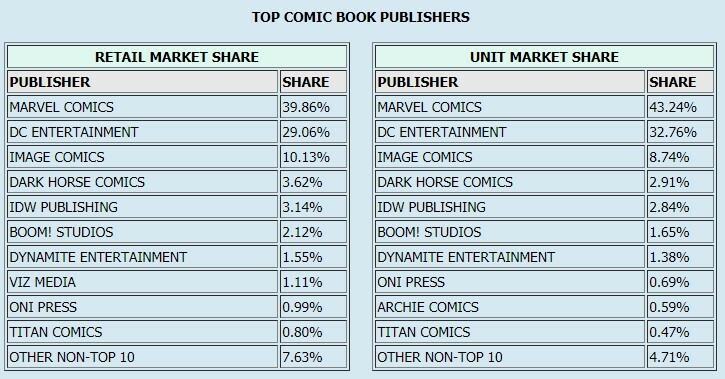 Image Comics was third with a 10.13% dollar share and a 8.74% unit share. 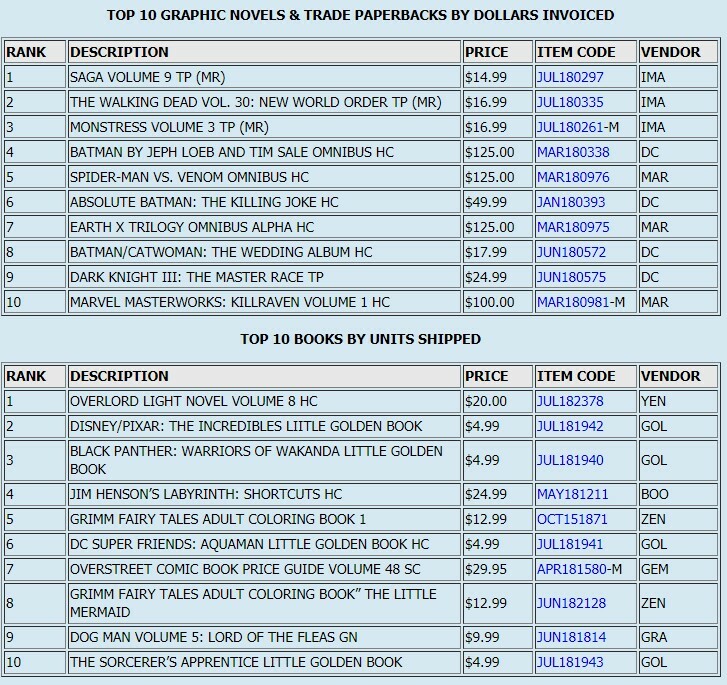 In fourth was Dark Horse Comics with a 3.62% dollar share and a 2.91% unit share, followed by IDW Publishing with a 3.14% dollar share and a 2.84% unit share, BOOM! Studios with a 2.12% dollar share and a 1.65% unit share, and Dynamite Entertainment with a 1.55% dollar share and a 1.38% unit share. Marvel Comics had five titles in the top ten. In addition to Return of Wolverine #1, Donny Cates, Gerry Duggan, Cory Smith, and Brian Level's Thanos Legacy #1 ranked #7; Fantastic Four #2 ranked #8; Nick Spencer, Humberto Ramos, and Steve Lieber's Amazing Spider-Man #6 ranked #9; and Spencer, Ryan Ottley, and Cliff Rathburn's Amazing Spider-Man #5 ranked #10. DC Entertainment had five titles in the top ten: Tom King and Clay Mann's Heroes in Crisis #1 ranked #2; Geoff Johns and Gary Frank's Doomsday Clock #7 ranked #3; King and Tony S. Daniel's Batman #55 ranked #4; Brian Azzarello and Lee Bermejo's Batman: Damned #1, the debut release of DC's Black Label imprint, ranked #5; and King and Matt Wagner's Batman #54 ranked #6. Among the premier publishers, Image Comics' The Walking Dead #183 ranked #19; Dark Horse Comics' Stranger Things #1, based on the Netflix series, ranked #20; BOOM! Studios' Mighty Morphin Power Rangers #31 ranked #111; IDW Publishing's Rick and Morty vs. Dungeons & Dragons #2, a co-publication with Oni Press, ranked #118; and Dynamite Entertainment's Vampirella/Dejah Thoris #1 ranked #129. Ending with a death that forever changes the series, Brian K. Vaughan and Fiona Staples' Saga Volume 9 from Image Comics was September's best-selling graphic novel and one of the five Image titles among the top ten. 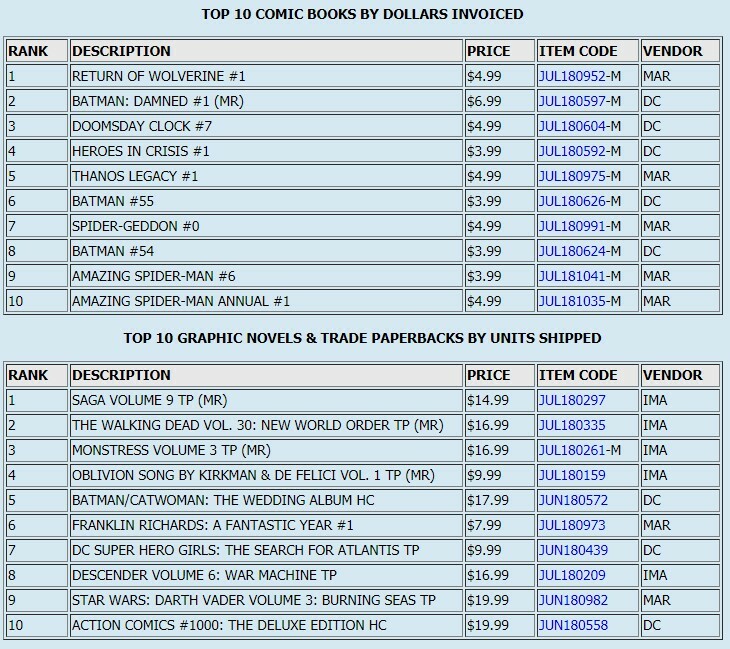 DC Entertainment had three titles in the top ten, led by Tom King, David Finch, Joelle Jones, and Mikel Janin's Batman & Catwoman: The Wedding Album at #5. 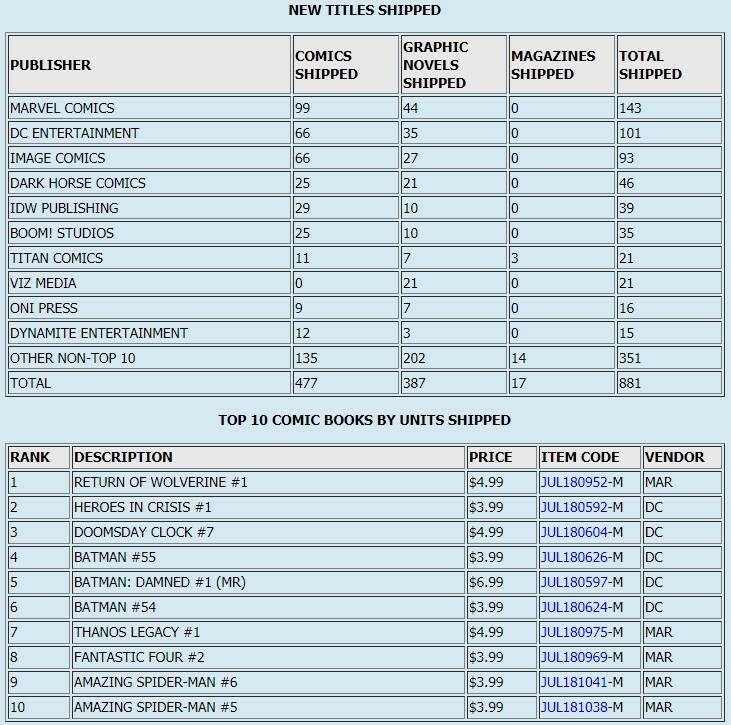 Marvel Comics had two titles in the top ten; their top book, Chris Eliopoulos and Marc Smuerak's Franklin Richards: A Fantastic Year, ranked #6. Yen On's light novel Overlord Volume 8 was September's best-selling book. Also in the top ten, BOOM! Studios' Jim Henson's Labyrinth: Shortcuts ranked #4 for the month and the softcover edition of Gemstone Publishing's Overstreet Comic Book Price Guide Volume 48 ranked #7. Josh Brolin's performance as Thanos was brought to life by Diamond Select Toys for the Marvel Gallery: Avengers Infinity War: Thanos PVC Figure, the best-selling toy product of September, and one of the four Diamond Select Toys products in the top ten. 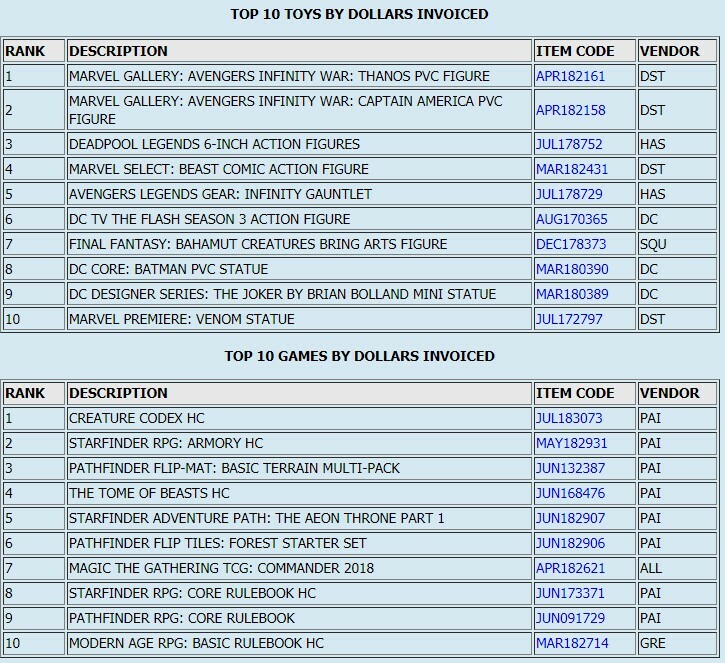 DC Collectibles had three products in the top ten, led by the DC TV: The Flash Season 3 Action Figure at #6. Paizo's Creature Codex, a sourcebook for the Pathfinder role-playing game and other 5E systems, was September's best-selling game product and one of the eight Paizo products in the top ten.